Inspired CollageTM launched in 2010. It is a kaleidoscopic blend of practices inspired by Scripture, journaling, meditation, and love for beauty and art. Through the power of images and self-discovery participants craft visual life-journals, creating deeper intimacy with God and others. Each workshop participant is greeted with a packet which includes select Scriptures and other workshop materials. 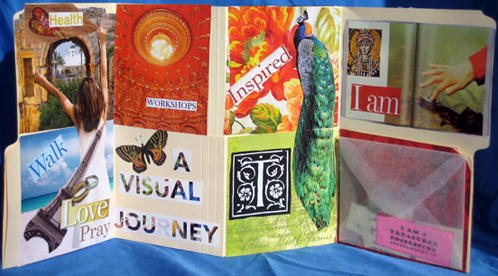 A presentation is given highlighting the workshop theme and the process of collage-making. Inspirational music along with reflective journaling takes place. Participants then transition to their search for images. Thousands of images are provided. Collaging together becomes an intuitive-imaginative process. Participants will find themselves gravitating toward images that have a personal meaning for them. Through this collage process of discovery, an illuminated collage emerges from the layers creating a lasting devotional experience. At the end of the workshop, participants will have the opportunity to share their reflective collages and their experience. Participants enjoy a rich atmosphere of fellowship during this day. Each person will take home a uniquely crafted card and a creative practice that can be used for individual Scripture meditation and continued growth. Each participant will receive an Inspired CollageTM Journal sheet and instruction regarding continued journaling and a meditation practice to take home with them. From ancient times Christians cultivated a practice of meditating. During the workshop you will learn 4 movements of Christian meditation. (Reading, Reflecting, Responding and Resting).